“Sixth Amendment to the Declaration of Restrictions, Conditions, Limitations, Easements, Rights, Privileges, Etc. For Sea Island, Georgia. The sixth amendment consists of 28 pages and attached are a couple of notes and three pages taken from amendment. After reading these pages my question is this, is Glynn County only a pass through agency for Sea Island and their Sixth Amendment after the Sea Island Committee has given their approval to a site plan? In fact, this usurps the authority of the Glynn County Local Issuing Authority (LIA) and building inspector because they do not have final say for a site plan. Glynn County can approve a site plan but under this sixth amendment it can be rejected by Sea Island through their sixth amendment and that is the final judgement. With the political powers of the Sea island people is it any wonder why we have so many problems over there. It is also becoming more and more obvious that the Sea Island Acquisitions (SIA) rejects the Shore Protection Act (SPA). Glynn County is nothing more than a puppet dangling at the ends of the SIA strings and we are all aware that Glynn County dances to the tune of the SIA BAND. I don’t see any problem with advertising this because my assumptions and conjectures were taken from their (SIA) sixth amendment. Historically speaking, before zoning and land use regulations came into being in this area, subdivisions for residential uses were governed by deed restrictions. 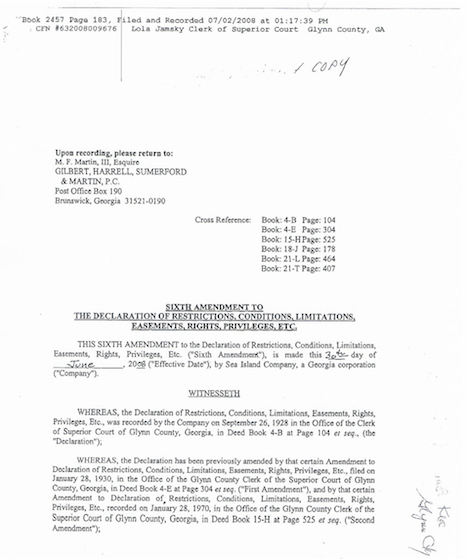 That is, when someone purchased a parcel or lot of land, they agreed to be bound by conditions set by the seller and, if those conditions were violated, the person could be sued, the sale reversed and the person expelled from the “community.” Racial segregation was maintained by such deed restrictions which prohibited the sale of lots to racial, religious and ethnic minorities. Such prohibitions in deeds were in the not so distant past declared to be un-Constitutional and, therefore, unenforceable in any judicial proceeding. Architectural criteria, having to do with the appearance of man-made objects, rather than natural persons, are able to be enforced to the extent that individuals have agreed to comply in completing their purchase of a lot in a particular enclave. If you read the condominium rules associated with The Reserve at Demere, you will be surprised at the extent to which buyers agree to limit their own behavior in order to remain members in good standing. For example, they agree not to use the garage, which is inside the house, for anything but storing a vehicle (no workshop or study). The extent to which people are willing to restrict their rights (when it’s agreed to, abuse is not abusive) in the interest of being considered special or part of an elite group is quite amazing. Of course, some people don’t read what they sign and agree to, so they don’t know they’ve signed away their rights until they try to use them and somebody objects. In the law, the more restrictive provision rules. So, for example, while Glynn County does not require drainage plans for the construction of a single family house, Sea Island, apparently does. The Architectural Review Committee is mostly about appearances. They do not cover building construction and safety standards. Nor do they supersede zoning and land use regulations. Whether local and state governmental authorities do their jobs is another matter. I suspect, for example, that if they had done their jobs, the Sea Island Company would not have built an underground garage and risked having a fleet of super-expensive cars being flooded out. They would not have had a chiller plant unconnected to the sewers and they would not have laid an inadequate sewer main up Sea Island Road. The County has been derelict. In part, that’s the result of a slightly mean attitude which holds that “those people” deserve what they get! Privilege is not all it’s cracked up to be. More in the morning. I don’t think what you’ve found can be published without some explanation. The plans I saw at the County have not been approved for construction. Governmental bodies are supposed to protect personal, property and environmental rights. They don’t always do what they are supposed to do unless we the people insist. No authorities are usurped by the Sea Island Property Owners Association. Even their own documents state it is in conjunction with local governing authorities. In fact, there are hundreds of home owners associations that have covenants and restrictions that control the architectural review process in their subdivision. Home owners covenants are enforceable in a court of law and many have used the courts to stop the homeowners from building structures not allowed by their covenants. When you by a home in a neighborhood with covenants and restrictions, the real estate people are required to make sure you have the appropriate documents. 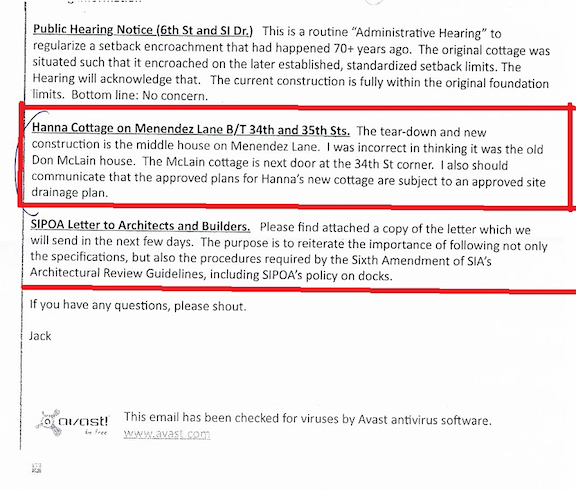 SIPOA cannot have covenants that are contrary to local, state, and federal laws, and neither can Sea Palms, Dunbar Creek, Shaws Bounty, Sinclair Point or any other homeowners association. But they can and sometimes do require restrictions over and above local ordinances, including architectural review boards. I know a lot of people that will not buy a home in an area that has a homeowners association because they don’t want their neighbors telling them what they can and can’t do to their house and lot. I also know a lot of people that won’t buy a house that is not covered by an HOA, because they want control over what their neighbors can build. Ultimately, It is up to the homeowner if they want to buy in a community that has an HOA. This does not allow them to do anything that is in violation to local ordinances. HOA’s are a vital part of any community and they have to submit their governing documents to the state, and maintained on file with the local clerk of superior court. I hope that clears up your concerns. What Sea Island’s Architectural Review Guidelines apparently recognize is what is commonly referred to as a “grandfathered” non-conforming use. That is, in most jurisdictions, a building or use that doesn’t conform to current law can continue until the use is ended (often for six months) or the building is destroyed by some natural force (fire, hurricane, etc.) The Sea Island folk seem to be more lenient in this regard and aren’t bothered that the original house, which was non-conforming to Island set-back requirements (perhaps because it was built before they were adopted) was voluntarily demolished by the new owners and are willing to have a new house built on the same foot print. Whether this leniency will be honored by Glynn County regulations, whose set-back criteria are based on safety requirements, rather than architectural consistency or style, is another question. It could be argued, and should be, that neither will countenance an expansion of the non-conforming use via the building of a swimming pool in the set-back area. 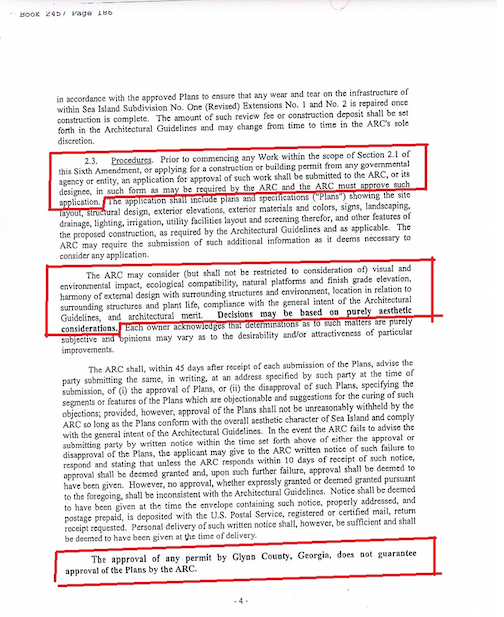 The highlighted paragraph suggests that the Glynn County Building Official has been acting to enforce the Architectural Review Committee’s claim to a prior veto or approval power, thereby saving the Sea Island Homeowners’ Association the need to go to court to enforce the contract into which home buyers enter when they purchase a lot. It does not say that Glynn County will approve whatever the ARC has agreed to. Whether the Georgia Coastal Resources Division follows the same pattern of making independent decisions or acts as a rubber stamp is another question. Property rights are not all what they are reported to be. Indeed, it could be argued that, like civil rights, they are more a bundle of duties and obligations and that we call them “rights” to make them easier to swallow. A close reading of the above tells us that when people voluntarily submit to or buy into a dictatorship, it’s not abusive. One could call it a variant of “informed consent” which renders the severance of a limb by a surgeon into a beneficial act, unless he negligently cuts the wrong one off. The ARC does not guarantee or warrant, and no owner, tenant, or occupant of any Building Site may presume that the ARC’s approval of improvements constitutes an assurance that such approved improvements are safe, fit for habitation or meet applicable zoning ordinance, building codes, or any other governmental requirements and engineering and architectural standards. 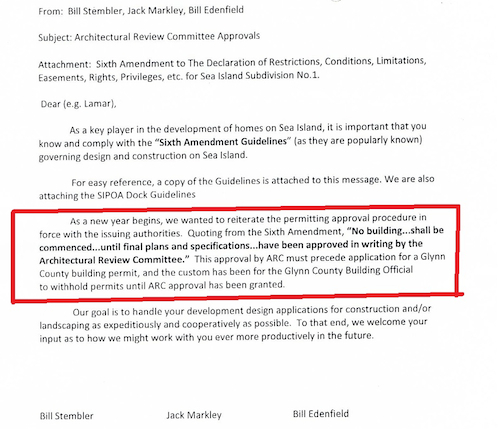 Furthermore, the ARC does not guarantee, warrant or ensure that all structures and improvements constructed within Sea Island are of comparable quality, value, or size, or of similar design. How’s that for a business model? How to account for why anyone would buy into it? All that comes to mind is VANITY.